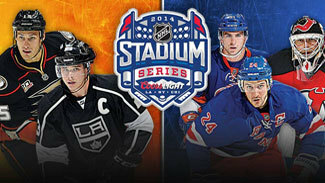 NEW YORK -- Tickets to the 2014 Coors Light NHL Stadium Series™ games at Dodger Stadium in Los Angeles and Yankee Stadium in New York will go on sale to the public next week, the National Hockey League announced today. Fans interested in receiving more information on ticketing, news and special offers around the event can register at www.NHL.com/2014LosAngeles and www.NHL.com/2014NewYork. Tickets to the Los Angeles Kings vs. Anaheim Ducks match-up at Dodger Stadium will be available for purchase via Ticketmaster.com and Ticketmaster.ca, the official ticket marketplace of the NHL, beginning at 10 a.m. PT/1 p.m. ET on Tuesday, Nov. 19. Tickets to the two games at Yankee Stadium will go on sale on both Ticketmaster sites at 10 a.m. ET on Thursday, Nov. 21. Part of the previously-announced 2014 Coors Light NHL Stadium Series™, a group of games planned for outdoor locations this season, the Kings and Ducks will face off at iconic Dodger Stadium at 6:30 p.m. PT / 9:30 p.m. ET on Saturday, Jan. 25. Two games will be played at Yankee Stadium when the New York Rangers face off against the New Jersey Devils on Sunday, Jan. 26 at 12:30 p.m. ET and the New York Islanders on Wednesday, Jan. 29 at 7:30 p.m. ET. The NHL also unveiled today the NHL Chrome Collection™, chrome-treated team logos specifically designed for use in connection with the 2014 Coors Light NHL Stadium Series™. The Ducks, Chicago Blackhawks, Kings, Devils, Islanders, Rangers and Pittsburgh Penguins will each utilize primary marks that showcase the special creative treatment. The Chrome logo designs are unique to the 2014 Coors Light NHL Stadium Series™ and inspired from the chrome details on the NHL shield, bringing a dynamic and modern perspective to conventional team identities. The Los Angeles event will mark a series of firsts for the National Hockey League and its fans as the Jan. 25 game will be the first outdoor regular season NHL® game played in California. In its 51 year history, the venerable Dodger Stadium has hosted eight World Series and close to 4,000 regular-season games, but never a hockey game. In its five year history, the new Yankee Stadium, which opened in 2009 and is already one of the most celebrated venues in all of sports, has played host to college football bowl games, concerts by Grammy-Award winning acts, soccer and boxing matches -- but never a hockey game, making the 2014 Coors Light NHL Stadium Series™ another true milestone for the Stadium, the NHL® and its fans. The game between the Kings and Ducks will be telecast nationally in the U.S. on NBC Sports Network and throughout Canada on CBC and RDS2. For the Rangers vs. Devils game on Sunday, Jan. 26, NBC will broadcast the game live nationally in the U.S., while CBC provides live coverage throughout Canada. For the Rangers vs. Islanders game Jan. 29, national coverage in the U.S. switches to NBC Sports Network, with TSN and RDS2 providing live telecasts across Canada. Sirius XM Satellite Radio will provide radio coverage of all three games.